On June 17, 1955, a fire "of undetermined origin" raced through several of the attractive, 1949 Spanish-style buildings, including the gift shop, café, and offices. 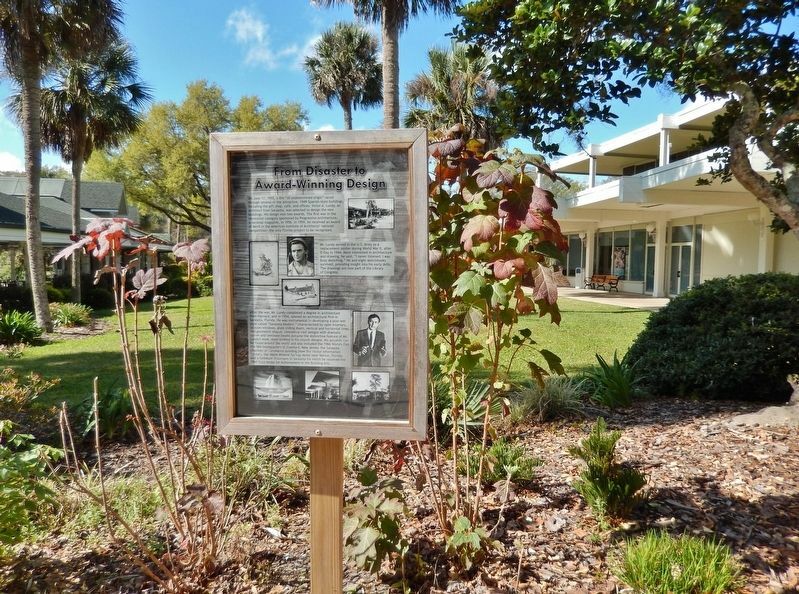 Victor A. Lundy, an architect from Sarasota, was selected to design the new buildings. His design won two awards. The first was in the recreation category sponsored by Progressive Architecture, a national magazine, in 1956. In 1959, he received an Award of Merit in the American Institute of Architects' national competition — the only Florida project to be recognized. Mr. Lundy served in the U.S. Army as a replacement soldier during World War II, after D-Day in 1944. More interested in architecture and drawing, he said, "I never listened; I was busy sketching." 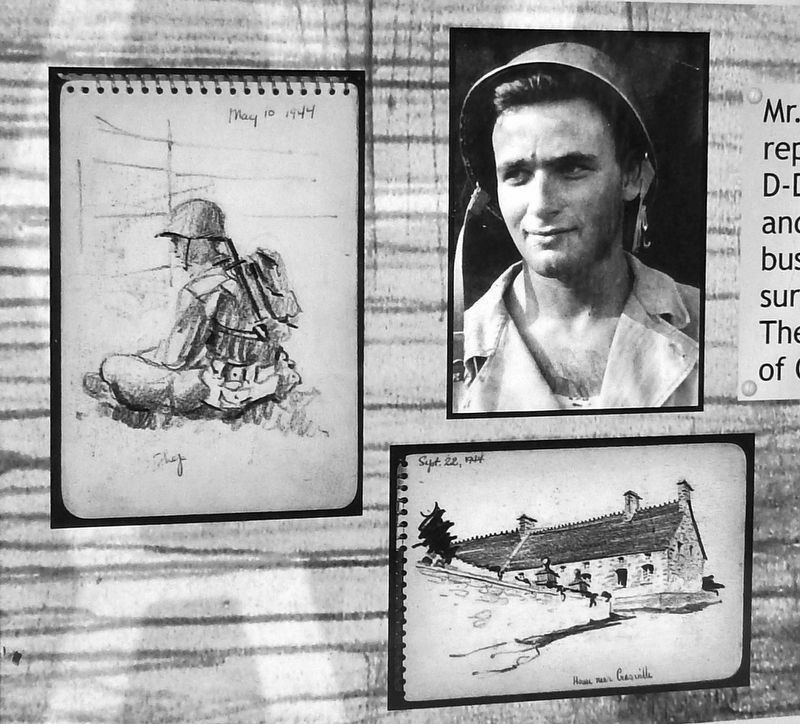 He and eight sketchbooks survived, providing insight into his early skills. The drawings are now part of the Library of Congress. doors, vertical and horizontal lines, and geometric shapes. Innovative roof designs with dramatic curves and laminate beams became the distinctive feature of Mr. Lundy's work, most striking in his church designs. 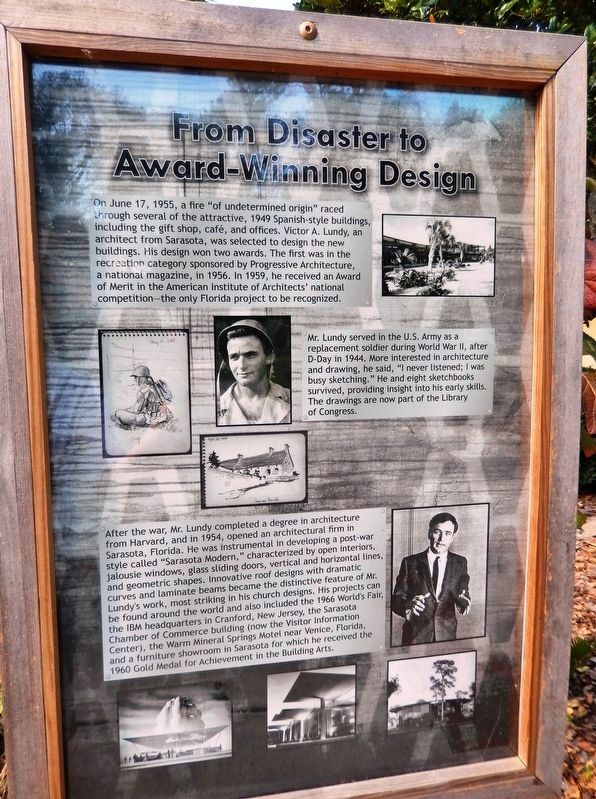 His projects can be found around the world and also included the 1966 World's Fair, the IBM headquarters in Cranford, New Jersey, the Sarasota Chamber of Commerce building (now the Visitor Information Center), the Warm Mineral Springs Motel near Venice, Florida, and a furniture showroom in Sarasota for which he received the 1960 Gold Medal for Achievement in the Building Arts. Location. 29° 12.996′ N, 82° 3.188′ W. Marker is in Silver Springs, Florida, in Marion County. Marker can be reached from Northeast 29th Place half a mile south of East Silver Springs Boulevard (State Highway 40). Touch for map. Marker is located in Silver Springs State Park, about 1/10 mile inside the park entrance, near the north end of the Visitor Center Pavilion. Marker is at or near this postal address: 5656 East Silver Springs Boulevard, Silver Springs FL 34488, United States of America. Touch for directions. (approx. 2.8 miles away); Marion County Confederate Memorial Marker (approx. 3.6 miles away); Ocala (approx. 5.3 miles away); Evergreen Cemetery (approx. 5.4 miles away); Ocala Demands (approx. 5.4 miles away). Touch for a list and map of all markers in Silver Springs. More. Search the internet for From Disaster to Award-Winning Design. Credits. This page was last revised on April 15, 2019. This page originally submitted on April 15, 2019, by Cosmos Mariner of Cape Canaveral, Florida. This page has been viewed 44 times since then. Photos: 1, 2, 3. submitted on April 15, 2019, by Cosmos Mariner of Cape Canaveral, Florida.